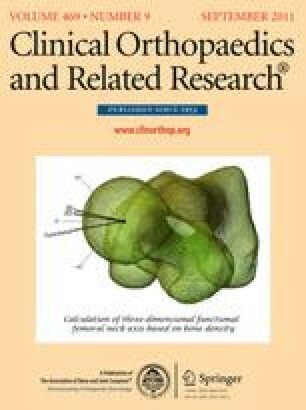 Reverse Prostheses in Arthropathies With Cuff Tear: Are Survivorship and Function Maintained Over Time? The use of reverse shoulder arthroplasty has considerably increased since first introduced in 1985. Despite demonstrating early improvement of function and pain, there is limited information regarding the durability and longer-term outcomes of this prosthesis. We determined complication rates, functional scores over time, survivorship, and whether radiographs would develop signs of loosening. We retrospectively reviewed 527 reverse shoulder arthroplasties performed in 506 patients between 1985 and 2003. Clinical and radiographic assessment was performed in 464 patients with a minimum followup of 2 years and 148 patients with a minimum followup of 5 years (mean, 7.5 years; range, 5–17 years). Cumulative survival curves were established with end points being prosthesis revision and Constant-Murley score of less than 30 points. Eighty-nine of 489 had at least one complication for a total of 107 complications. Survivorship free of revision was 89% at 10 years with a marked break occurring at 2 and 9 years. Survivorship to a Constant-Murley score of less than 30 was 72% at 10 years with a marked break observed at 8 years. We observed progressive radiographic changes after 5 years and an increasing frequency of large notches with long-term followup. Although the need for revision of reverse shoulder arthroplasty was relatively low at 10 years, Constant-Murley score and radiographic changes deteriorated with time. These findings are concerning regarding the longevity of the reverse shoulder arthroplasty, and therefore caution must be exercised when recommending reverse shoulder arthroplasty, especially in younger patients. Each author certifies that his or her institution approved or waived approval for the human protocol for this investigation and that all investigations were conducted in conformity with ethical principles of research. This work was performed at Service Orthopedie Traumatologie. We thank Allan Young, Gilles Walch, Pascal Boileau, François Sirveaux, Carlos Maynou, Philippe Valenti, and the French Society of Orthopedic Surgery for their participation in this study.